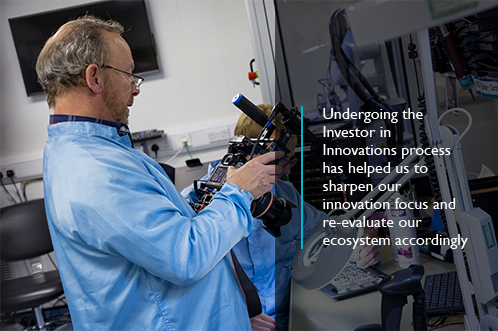 We are very pleased to announce that the Defence Mission Systems (DMS) business of Thales in the UK has successfully completed the Investor in Innovations (I3) Standard conducted by the Institute of Innovation and Knowledge Exchange. Defence Mission Systems in the UK employs about 1200 people and has an annual turnover of approximately £350 million. The engineering business invents, designs, develops, manufactures and maintains a wide range of products and services primarily for ships, submarines and aircraft including advanced work on autonomous vehicles for different applications such as unmanned surveillance and mine-countermeasures. Thales Defence Mission Systems innovation portfolio spans multiple technology spaces, which includes amongst others, airborne radars, sonars, electronic warfare and specialist communication systems; these are used in a variety of manned and unmanned platforms. The Investor in Innovations is an integrated, leading-edge standard that uses a structured and balanced framework to benchmark and validate an organisation's innovation capability. It deploys a practical process that helps organisations to drive growth by providing a clear action plan to enable the organisation to constructively align its innovation efforts with the direction of the business strategy. The UK Defence Mission Systems business innovation capability was assessed in six key areas that included: Strategy & Alignment; Organisational Readiness; Core Capabilities, Technologies & IP; Industry Foresight; Customer Awareness; and Impact and Value. Steve Morfey, DMS Engineering and Technical Director said: "Defence Mission Systems implements an array of techniques to encourage innovation organisationally and technically. Undergoing the Investor in Innovations process has helped us to sharpen our innovation focus and re-evaluate our ecosystem accordingly. It also provided an excellent platform to recognise the collective efforts of all those who participate in innovation." "We wanted to have an independently validated plan that evaluated our innovation capability, helping us to reconfigure our ecosystem and ensure that we continue to have a clear competitive edge and drive growth. We found the process to be very valuable, particularly in providing impartial views on innovation from both the visiting panel and those Innovation Council reviewers. The I3 process has enabled us to have an action plan that will accelerate our growth strategy." "Every now and then, it is important for a company to take stock of its innovation activities and recalibrate its efforts to ensure a sustainable innovation pipeline exists. 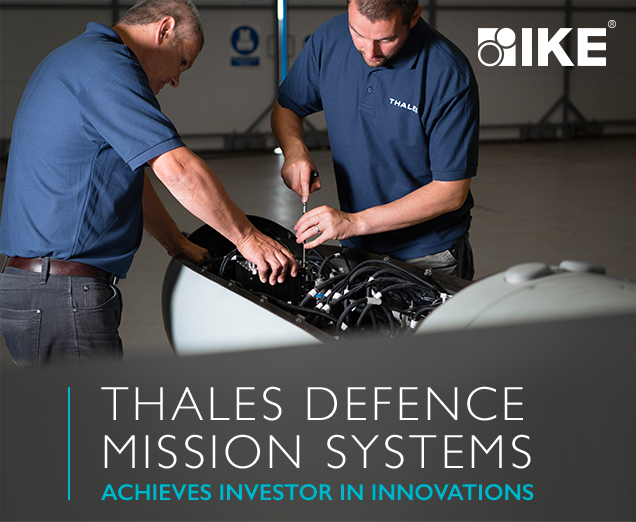 Both divisions of Thales Defence Mission Systems have demonstrated commitment to systematic innovation in their products, processes and people, as well as in the way that their business models are configured to reflect the evolving customer needs in the UK, and internationally. Following the I3 process, a set of clear impact scorecards have now been generated to support Thales in the delivery of its ambition ten growth plan. The Defence Mission Systems (DMS) in the UK supplies Thales products and services to both the defence and civil markets. In defence, Thales supplies the armed forces with Electronic Combat Systems (ECS), Airborne Intelligence Surveillance and Reconnaissance (ISR) solutions, including Watchkeeper, and Sonar systems with related Services. 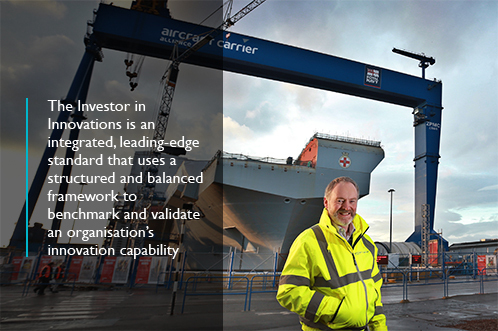 Thales is also part of the Aircraft Carrier Alliance (ACA) that is delivering the Royal Navy's Queen Elizabeth Class aircraft carrier programme.